Transform your circle time area to look like an art gallery. Transform your circle time area to look like an art gallery. Display pictures of art or various artists (Open picture game - Artists) or (Open word flashcards - Artists). Print and glue them on the floor. Variation: Use pictures or illustrations from magazines. Each morning, invite children to sit near the piece of art they prefer. Fill a container with objects or pictures which represent the artists you are discussing. Open the container and have each child pick an object. One by one, children present their object to the group (with a little help from their daycare worker). Designate a wall which shall be used solely to display children's art. Call it your "Little artists' wall" if you wish. If possible, make sure children and parents can admire it. You may also use a clothesline and hang the artwork with clothespins. Take pictures of children completing artwork and display these too. The pictures may be used as a memory game or to spark a conversation with the group. Use them to decorate your daycare or a specific thematic corner. 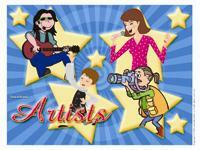 (Open picture game - Artists) Print, laminate, and store in a "Ziploc" bag or in your thematic bin. Activity sheets are suggested for each theme. Print and follow instructions (Open Activity sheet-Artists). Colored cardboard circles may be used to cover the floor. This will make it look like an artist's palette. Posters of various masterpieces may be used to decorate the area and inspire creativity. Recycled material of all kinds to create various sculptures over and over again. Finger painting on glossy paper. The back of old posters can be recycled for this activity. Abstract sculptures using recycled material. Painting with sponges or toothbrushes on a large paper hung on the wall. Create a movie poster using paint or by creating a collage. Coloring pages related to different types of art. Waxed crayons, wooden crayons, markers, charcoal crayons, etc. At the movies: Make your own television or movie theater screen. Arrange rows of chairs just like in a theater and add empty popcorn containers, a few glasses, tickets made by the children in your group, and you are set! Add illustrations from various movies to decorate. Painter: Easel, a color palette, paint samples (from your local hardware store), a few pictures, and paintbrushes. Comedy: Provide costumes of all kinds and a large mirror. Photography: Old cameras which no longer work and photo albums. Fashion designer: Plastic needles, fabric, yarn, etc. Memory game about artists using the educatall picture game or a store-bought version. Provide real musical instruments for children to manipulate. A large quantity of modeling dough children can use to pretend they are sculpting. Provide several accessories they may use for cutting and sculpting. Various sizes, shapes, and textures of paintbrushes. A cookie sheet filled with sand. Children can trace shapes, letters, etc. using the tip of a paintbrush. Books about different forms of art with beautiful illustrations. You may choose to exceptionally add a television and a DVD player in your area to create a movie theater. Explore the letter A like Artist. Notebooks and pencils for writing like authors. Create an obstacle course involving various stations: paint, finger paint, sculpting, song, etc. A fashion show... with obstacles. Bin filled with snow for sculpting. Bin filled with wet sand for sculpting. Bin filled with colored water. Oil painting or water painting: in a variety of transparent airtight containers. Let children explore the combinations of oil and colored water. Use eyedroppers to add oil to the water and vice versa. Shake the container, let it set, etc. Cookies or cakes with colorful icing made with food coloring. Paint or dye made with food items or items found in nature. Experiment color combinations and have children predict the results. (Open dominoes - Artists) Print, glue on cardboard, and laminate. This game is for two to four players. Each child picks five cards. Set the remaining cards in a pile on the table. Turn over one card and the first player tries to match an illustration on one of his cards to an illustration on the card which is on the table. The two matching illustrations must touch. If a player is unable to match one of his cards, he must pick a card from the pile. If he is unable to play this card also, his turn is over. The game ends when a player has no cards left. (Open perpetual calendar - Art day) Print and plan special days throughout the year. Thematic bin: microphone, costumes, mirror, empty makeup containers, musical instruments, glasses, scarf or boa, tape recorder and cassette, song books, books containing musical partitions. 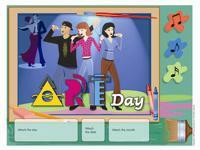 (Open perpetual calendar - Musical Day) Children bring a musical instrument or their favorite CD from home. Have them play music in canon. Eat to the sound of music, following the rhythm. Select food items which are noisy when you eat them. Listen to yourselves chewing. Ask a child to choose a song he knows and sing the first line. If one line is not enough, have him continue, one line at a time. The other children try to guess the name of the song. Cover an empty toilet paper roll with aluminum paper. Apply glue to a Styrofoam ball and roll it around in a plate filled with sparkles. Insert the ball in the end of the roll. Children each choose which star they wish to be and take turns imitating him or her. With musical instruments, ribbons, and scarves, parade around your neighborhood. Use an old shoe box to make a guitar. Make a hole, about 8 cm in diameter, in the cover. Put the cover back on the box. You will need six elastics of different sizes. Slide them next to each other over the hole. Children pinch the elastics to create guitar sounds. Use empty soft drink bottles to make music. Simply hold them in front of your lips and gently blow over the opening. Fill the bottles with various levels of water to create different sounds. Each child has a musical instrument and so do you. To begin, you are the orchestra conductor. Name children to play the role as the game continues. The orchestra conductor creates a rhythm with his instrument and the rest of the group must reproduce it. Continue as long as children remain interested. Close off one end of an empty paper towel roll with a piece of cardboard and adhesive tape. Fill the roll with rice until it is half full. Have a child hold it while you close off the other end of the roll. Children can decorate their maracas. Shake the maracas to produce various rhythms and have the group repeat them. Once you have made one or more musical instruments, play musical chairs, musical ball, musical scarf, musical drawing, etc...The important thing is that you listen to music all day long! Open the word flashcards of your choice. Print and glue a different word to the back of each chair. Play music and have children walk around the chairs. When the music stops, children sit on a chair and name the word glued to the back of it. You will need six to eight glass jars. Fill every jar except for one with different quantities of water. The last jar should be completely full. Add a few drops of food coloring to the water so the levels are easier to see. Children discover the different sounds they hear when tapping the jars with wooden and metal spoons. Line the jars up beginning with the empty jar all the way to the jar which is full. They will produce the highest pitch to the lowest pitch.Variation: Add objects such as metal cans, a cardboard box, and plastic containers. Encourage children to observe the different sounds produced. Thematic bin: various colors of thread, empty spools of thread, rulers, chalk, buttons, fabric with various textures, elastics, tracing paper, clothing items, toy sewing machine, container with several compartments for storing sewing material, Velcro, scissors, plastic needles, zippers, books, catalogues, and flyers with pictures of clothing, thimble, etc. Organize a fashion show with clothing you made with the group during the theme. Name your show the (daycare's name) collection. Invite children from other groups or parents to attend your fashion show. If you decide not to make the items of clothing in the arts & crafts section, you may invite children to wear their favorite piece of clothing or use clothing from your dress up box. Collect pictures of clothing and laminate them. Make holes around the contour of the pictures using a hole-punch. Provide laces or yarn children may use to "sew". Have children pretend there are seamstresses or tailors. Provide pieces of fabric, old clothing items, scissors, a measuring tape, etc. Allow them to cut the clothing items, remove buttons, etc. Use two empty Kleenex boxes per child to make silly shoes. On either side of the opening on the boxes, make holes using a hole-punch to thread laces through. Let children decorate their shoes using art supplies. Variation: Have children bring an old shoe to the daycare. They paint and decorate their shoe. You may add eyes, feathers, buttons, etc. Display them on a shelf for parents to admire. Make holes for children's head and arms in a brown paper bag. Have them decorate their sweater using fabric and ribbon.Variation: Ask children to bring a plain white t-shirt to the daycare. Paint and decorate it with fabric paint or transfer a picture to the t-shirt. Using a large roll of paper, measure each child from his waist to his ankles and cut out both the front and back of a pair of pants for each child. Staple the contour of the pants and cut a slit between each pant leg. Staple again. Have each child draw details on his pants.Variation: Have children bring an old pair of pants to the daycare. Paint and decorate them with fabric paint, patches of fabric, or sparkles. Use garbage bags. Make holes for children's heads and arms. Next, make a slit for the head all the way to the bottom of the coat. You may make fasteners out of pipe cleaners to tie the coats. Children decorate as they please. Children find a partner. One child plays the role of the fashion model and the other child is the designer. The designers select clothing items from a trunk and dress up their fashion model as they please. Have them present their fashions to the group. Thematic bin: plastic camera, photo album, old pictures, sheets, posters (for decorating). Have parents provide pictures of their children. Cut them and glue them on 10 cm x 13 cm paper. Place two pictures back to back in "Ziploc" bags. Staple all the bags together at the closed ends. You will be able to remove the pictures if necessary. Use colorful adhesive tape to cover the staples. Children will love admiring their photo album. Children take turns being the photographer. The other children dress up and strike various poses for the photographer. Once done, the photographer draws the pose he liked most. You are the photographer! Throughout the day, take pictures of the children in your group. Use the pictures to build a photo album which shows the daycare routine. (Open model - camera) Print the model and trace it on heavy cardboard. Cut it out. Each child should have his own camera. Invite them to use it to take a picture of the activity they enjoyed the most during the day. Before going home, have each child draw the picture they captured with their camera (Open model-picture). They may present their pictures to the group. Thematic bin: notebooks, chalkboard, different types of paper, stamps, ink, chalk, pencils, pens, etc. 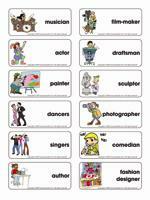 (Open word flashcards - Alphabet) Print and laminate. Deposit all the word flashcards in the centre of a parachute or blanket. Children hold the corners of the parachute firmly. When you give the signal, they raise the parachute above their heads. When the word flashcards fall, have children read them before starting all over again! Children become illustrators. They must work with ink. Provide envelopes, stamps, ink, stickers, boxes, wrapping paper, pens, a ruler, index cards, stamp pads, bags, cardboard, etc. Set up a table with old computer keyboards and typewriters. Children pretend they are journalists and write imaginary stories. Have children search for toys within the daycare which have letters or words on them. Help them identify the letters and words. Provide pens, wooden pencils, notebooks, stationery, alphabet stencils, and envelopes. Have them write letters they can mail to the daycare or to their parents. Use black construction paper. Children glue tiny pasta letters on it. Variation: You may use colorful letters for this craft or in a sensory bin. Combine 2 tablespoons of food coloring and 3 tablespoons of rubbing alcohol in a container. Add 1 pint of pasta and cover. Gently shake the container making sure to coat all the pasta with color. Spread pasta in a single layer on a cookie sheet and let dry several hours. Collect pictures from a coloring book or mismatched pictures which have been removed or torn out of storybooks. Remove all text. With your group, arrange the pictures in a particular order and invent a story to accompany them. Write the story below the pictures. Make photocopies for each child and join the pages together to make a book. This part may become a craft. Make holes in the pages and have children thread yarn through the holes. Encourage children to write words with "Alpha Bits" cereal. Thematic bin: crayons, chalk, markers, notebooks, chalkboard, stamps, ink, paper, pens, stencils, etc. Children sit in a circle. Give a sheet of paper and crayons to one child. He begins drawing. Play music. When you stop the music, the child must stop drawing and pass the paper and crayons to the child sitting next to him. Continue the game until everyone has had at least one turn. The final result will be very interesting! Provide paper and crayons. Set a timer for five minutes. When you say, "go!" children begin drawing. When the time is up, they must stop drawing even if they are not done. Have children draw on black paper using white crayons. Have them reproduce the same drawing using a black marker on white paper. Print the coloring pages of your choice in the educatall club. Print and provide crayons and markers for children to color with. Have children look at themselves in a mirror and draw what they see on a face outline (Open face outline). Print for each child. Have children present their self-portraits. (Open mandalas) Print and deposit in the centre of the table. A mandala is a structure which helps concentration. Invite children to choose a mandala to color. It is important that you allow children to set aside their mandala and return to complete it at another time. Show children they have a left hand and a right hand. Explain that they will have to draw a picture using one of their hands, and then with the other. You may want to use two different papers and identify which hand children drew with on each. If you prefer, simply divide a sheet of paper in two and write which hand is used in a corner of each section. Have children draw with various parts of their body (toes, knee, elbow...) phenomenal results await! Lay a large sheet of paper on the floor and have a child lie down on top of it. Trace the contour of the child. Cut out the silhouette and glue it to the wall. Children decorate their silhouette using markers, wooden pencils, fabric, etc.). Provide children with scented markers. Help them indentify the scents they use. Thematic bin: old clothing items, hooks for hats, caps, wigs, scarves, jewelry, costumes, baskets or removable drawers to store decor accessories. You can create a magnificent theater using large cardboard boxes. Paint and decorate them with your group. You can even add small lights around the contour of your theater (miniature Christmas lights). Hang curtains from the ceiling and a mirror on the wall. If you have children of different ages in your group, you may choose to organize a presentation around a specific song's lyrics. This will be easier than learning an actual play. Enjoy being a producer! Theater is great for every aspect of children's development. Set up a small theater area you can use to put on a mini talent show. Have each child prepare a small sketch, dance, song, etc. They will love presenting their talent to their peers. Make shadows on a large white sheet hung from the ceiling. You may use white cardboard too. Children will enjoy creating animal shadows (a frog for example). Have children guess which shadows their friends are making. You may use your hands or cut out animal shapes and glue them to popsicle sticks. Have children pick a partner. Let them paint each other's faces. Group children two by two and provide each child with a large sheet of paper. Have them take turns lying down on the paper. Their partner traces the outline of their body with waxed crayons. Next, they can decorate their silhouette and glue the giant puppets on the walls. The outcome of this activity depends on the ages of the children in your group. Improvisation can easily be adapted. You may begin by having children mime emotions. For older children, you may even try short sketches. Thematic bin: various sizes of paintbrushes, rollers, bowls, trays, aprons, ribbon, hats, paint samples, wooden sticks. Hang a large piece of paper on the wall. Have children stand with their back to the wall to paint. They must hold their paintbrush in their hands and paint without seeing what they are doing. Have children hold their paintbrush between their toes instead of with their fingers to create their masterpieces. Provide children with glossy paper and finger paint. Let them create freely. (Open color combinations) Print, laminate, and display for children. Present them with glasses of water, food coloring, and small spoons. They use the material to create colors through various combinations. Add a few drops of food coloring to prepared bubble solution. Have children make their own bubble wands using pipe cleaners. Give them each a sheet of white paper and have them blow bubbles on the paper. Beautiful pastel art will appear. Have children use rainbow-colored waxed crayons to draw on glossy paper. When they are done, have them paint over the entire paper with black paint. Allow to dry. Once dry, have them trace over the black paint to discover the rainbow colors. Offer old shirts children can wear as smocks. Hang large pieces of paper on the wall and lay an old sheet on the floor. Encourage children to paint with different types of paintbrushes. Provide them with several colors and bowls they may use to mix colors. Let children mix colors together on their very own paint palettes. Use large Styrofoam plates like the ones used for meat. Make a small hole so children can hold them like real painters. 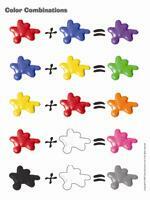 (Open memory game - Colors) Print, laminate, and cut out. Arrange the cards face down on the table in rows. The first player turns over two cards. If they match, he keeps them and plays again. If they do not match, they are turned over and it is the next player's turn. Make sure that all players have a chance to see the cards turned over by others. The object of the game is to find as many pairs as possible. The winner is the player with the most pairs. Collect small pails of water and paintbrushes (like the ones used to paint walls). Children will love painting in your backyard. Have them paint the fence, the tables, the outdoor games, etc. Have children paint on a pillowcase, a sweater, or a simple piece of felt. Purchase small pieces of lightweight wood. Drill a hole in each piece so you can thread a ribbon or string through to display the completed project. Let children paint as they wish. Go for a walk with your group and have each child choose a rock. Set up a tub of water and invite children to wash their rocks. Once dry, children can paint their rocks. Paint and hang in the daycare to decorate. Provide children with a huge piece of cardboard and a wide range of paint colors. Have them shake their paintbrushes so the paint is projected on the cardboard. The will love creating fireworks! Let children paint on the daycare windows. You will need a small quantity of water, soap, and a small scraper to clean up. Pour paint into small containers and add a popsicle stick. Freeze. Let children paint with their frozen paint. Use transparent sheets like the ones used to protect documents. Separate the two layers. Have children paint on the plastic. Wet the side of the sheet which was not painted using a wet washcloth. Stick the artwork to a window. You may have each child make a handprint and cut it out. What a beautiful craft! Collect sand and dirt with your group. Add water to make mud. Give them paintbrushes and let them paint on their body (if it is summer). Use the hose to clean up. Have children mix sand and powdered paint. Divide the different colors in empty soap bottles. Children put glue on their paper and sprinkle sand over it. You will need miniature marshmallows and uncooked spaghetti for this activity. Let children create all kinds of sculptures and display them...just like in a museum! Provide your group with a large quantity of modeling dough. Encourage children to create collective sculptures. Provide children with a large quantity of salt dough. Invite them to create collective sculptures. Fill a tub with dirt and water. Children will love exploring the texture and making sculptures. Deposit a large block of ice like the ones used for coolers in a large container. Invite children to scratch the ice with spoons to make sculptures. Allow children to play with blue Jell-O which you deposited in a large tub. Add Jell-O cubes they can use to make sculptures. Purchase a block of clay. Let children create small plates, bowls, etc. Allow to dry per package instructions before painting. Use recycled material (metal cans, yogurt containers, empty toilet paper rolls, etc.) to make sculptures. Add hot glue if necessary. This may become a collective project. Display. (Open creative coloring - Artists) Print for each child. Have the complete their masterpiece.